Veteran indie rock band Pentagram’s first studio album We Are Not Listening, released in 1996, showcased the band’s alternative rock and metal influences, while their second studio album Up saw the band lean more towards electronica. 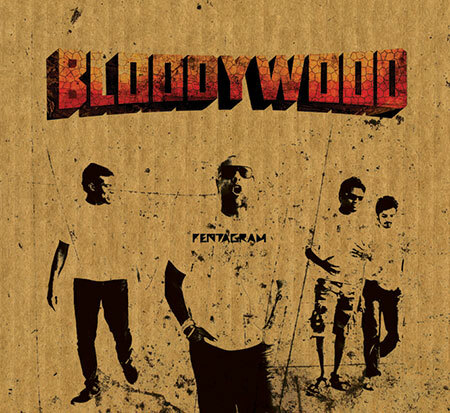 Now, with their fourth album Bloodywood (2011), they seem to have struck a balance between the two. The name itself suggests an alternative: a parallel to the commercial world of Bollywood and the mainstream in general. It represents a subculture that is independent of the mainstream. Overall, the lyrical theme of the album focuses on the need for change and a need to question and challenge the existing system. With the 14 songs on the album, Bloodywood takes you through various genres from punk and grunge to dub and drum and bass. It begins with ‘Identify’, as front man Vishal Dadlani urges you to question yourself (“What’s your name / Where’re you from / Identify / Identify / Identify”). The song sets the pace of the album, which is generally frenzied and urgent, much like Mumbai city itself, which has been one of the band’s primary influences. Again, heavy drums seem to be another prominent feature of Bloodywood on the whole. The beginning of the following song, ‘This Could Get Ugly’ seems to be slightly reminiscent of a Shaa’ir and Func track. While We Are Not Listening and Up spoke of the outside world and external social and political situations, Bloodywood focuses on the need for one to change his individual mindset first, as is seen in ‘Mental Zero’, first premiered at a concert at Carter Road promenade in 2009 (“I can take you to the water / But I can’t make you drink / I can take you to the process / But I can’t make you think”). Parts of tracks like ‘Human Failings’ and ‘Technology—I Get You’ have also been previously featured in various episodes of Penta TV. ‘Lovedrug Climbdown’ and the mellower ‘Nocturne’ will probably prove to be two of the most popular tracks of the album, with their instantly catchy choruses. Bloodywood ends aptly with ‘Nocturne’, which sums up Mumbai as a city that never sleeps, even though there might occasionally be a false sense of calm (“Streets clear up / Phones are quiet / Like the calm before the riot”). Pentagram were the first Indian act to headline the Sundance Music Festival in Estonia in 2003 and have the distinction of being the first Indian band to play at the Glastonbury Festival in 2005, sharing the stage with the likes of Tori Amos, the Chemical Brothers, Fatboy Slim, and the White Stripes. Now, with Bloodywood, after 17 years at the top of the Indian rock scene, they have become part of an elite league: they are now one of only two independent rock bands in the country to have released all of four studio albums. By Urvashi Bahuguna · Amruta Patil returns the Mahabharat closer to its original canvas; far more crowded and complicated than most Indians may be familiar with.